A quarter of the body’s bones and muscles are below the ankle. Our feet actually contain 33 joints, and 26 bones, which is an impressive fun fact, don’t you think?Nature designed our feet to have so much intricacy for a reason and those 33 joints have an almost infinite number potential movements, because once upon a time we would have had to manoeuvre over different textures and terrains when walking every day. Today our lives are vastly different from how they would have been, we no longer have the requirement to walk long distances to obtain our food and our mobility is assisted with flat surfaces like asphalt or carpet. We mostly wear shoes which is essentially like putting our feet in a cast, and over time this means the little tiny muscles in our feet have atrophied from lack of use. But the fact that we no longer need to walk many miles a day over different terrains doesn’t mean we don’t need the use of all those muscles and joints in the foot. Thinking of the human body as a unit requiring the health of each individual part to work functionally as a whole, we can start to understand how the things on the ends of our legs, our primary contact with the ground, might have an effect on what happens further up. You could take that further and say we are actually a community of trillions of cells, each of which needs to obtain some of the nutrition we eat and oxygen we breathe. If the way our cells obtain glucose and oxygen is through blood flow which is created via mechanical stimulation, any parts of our body we don’t move (like the feet), are effectively being starved of circulation and therefore the nutrition they need to survive. I read this in Move Your DNA by Katy Bowman a while ago (highly recommended reading by the way) but was reminded of the fact when one of my clients asked me if I felt like I’d had a shot of adrenaline after stretching my feet over a tennis ball. I said no, not really, but I’ve been stretching my feet for years now and gradually transitioning to more minimal shoes… so the cells that make up the intrinsic muscles in my feet haven’t been starving to the extent that a lot of people’s have. As a population we’re plagued with foot issues like fallen arches, plantar fasciitis, bunions, neuromas, hammertoes, ingrown toenails etc… What if the common belief that these issues were genetic and out of our control was largely misinformed and, actually, our foot issues weren’t completely separate to other body issues such as pelvic floor disorder, lower back pain, knee weakness, shin splints, chronic headaches or even shoulder issues? They don’t allow your joints to articulate individually because of a stiff or thick sole. They have an elevated toe spring which slows down circulation to the feet. They have a heel of some description which, no matter how small, will be displacing your pelvic alignment. In fact, the more ‘comfortable’ a shoe is, the more support and cushioning it is likely to have, which is going to be reducing the amount of work your intrinsic foot muscles can do. Lots of people tell me they don’t wear heels but the majority of shoes have some difference in height at the heel, and for every degree of heel height there is a degree of spine vertebrae, hip joint or knee joint reaction. The inch heel that you usually find on a man’s shoe or a good walking shoe could be causing up to 20 degrees of misalignment through the rest of the body (depending on the length of your foot). 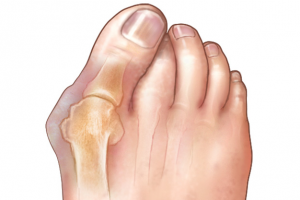 Bunions are described as an increase in tissue development or swelling around the big toe. 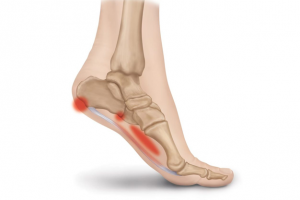 People often think their bunions are genetic because their parents and grandparents had them, however, it’s our alignment rather than genes that create the unnatural loading of joints which creates many foot issues. As we develop in childhood we learn through observation, picking up from our parents their habits, posture and walking patterns, so the turnout in our feet is probably something copied from everyone around us. The combination of wearing shoes with a narrow toe box that encourages the big toe to turn in towards the smaller ones, together with the turnout of feet which creates increased side to side motion rather than front to back motion has us repeatedly rolling over the side of the big toe joint rather than the body rolling off the tip of the big toe like it should in normal gait, causing inappropriate loading of the joint which will eventually lead to long term foot issues. Then there’s plantar fasciitis. A condition that often accompanies bunions, named because an ‘itis’ is an inflammation.It was thought for many yearsthat people experiencing the heel pain known as plantar fasciitis had an inflammation of the large tendon on the sole of the foot, the plantar fascia, because the tendon which attaches to the heel bone is being pulled. The usual treatments for it are the use of insoles, extra cushioning, and cortisone injections – there is even a routine surgery to cut the plantar fascia to release the tension, which is bonkers in my humble opinion, and these have all proven to be ineffective treatments for most people. There is a group of muscles on the back of the body called the posterior chain, connected through lines of tissue known as the fascia. If we have chronically tight hamstrings and calves, possibly due to the amount of time we spend sitting or wearing heels (or both), those tight muscles pull on the joints, causing incorrect alignment of the knee, with the weight moving forward and thus pulling unnaturally on the heel which is held by the plantar fascia. A better way to treat it might be to change our movement patterns, stop tucking our pelvis and encourage more length in the posterior chain (hamstrings and calves), therefore releasing tension on the tissues of the sole of the foot. However, there is also speculation that the condition might be more accurately described as a ‘osis’ (meaning abnormal or diseased) than an ‘itis’ (inflammation). In 2003 a study of 50 people was carried out where small amounts of plantar fascia tissue was harvested during the above mentioned routine surgery. Whilst no inflammation was found in any of the 50 test participants, what was found was micro tearing and dead tissue, meaning that it would make sense that something was cutting off blood supply to the tissues and therefore preventing cell regeneration. When the big toe gets pushed over and lifted up by the elevated toe spring in a shoe, it also pulls the tissues of the foot and in particular a specific muscle (called the abductor hallucis) which attaches to the big toe. There is an artery that goes under that muscle that, if it were to become restricted, would limit blood supply and cause the cells to die. On searching the internet for further evidence or more information, opinion seems to be divided as to whether it’s always a degeneration rather than inflammation and whether it simply develops into degeneration if left untreated. Either way, a better solution might be to change our footwear to have no heel and a wide toe box which allows the toes to spread, so that we can encourage a natural arch and better blood flow. How do these and other foot conditions relate to knee, lower back and pelvic floor issues? Our footwear might be contributing to any number of issues due to the earlier mentioned reactions of joints to any degree of heel height.If your pelvisis tucked and knees slightly bent, the hamstrings and pelvic floor muscles are shortened making them less effective, causing the quads to become tight which puts pressure on the knees. When the posterior chain (hamstrings and calves) is chronically tight you lose the ability to bend effectively, putting the discs in your lumbar spineat riskevery time you bend if you curl up like a cashew nut because you’re flexing the spine instead of hinging at the hip. People with diabetes are more at risk of foot health problems because of increased risk of neuropathy (damage to the capillaries and nerve fibres caused by high blood glucose levels), so keeping the muscles of the feet innervated (stimulated through nerves) will help with prevention of loss of sensation. If you have bunions or fallen arches there’s a high chance that your knees roll in and your glutes aren’t engaging as well as they could be which eventually causes hip and knee problems. So, what can you do to look after your feet? Change your footwear (I’m not saying everyone should immediately go out and buy some Vibram Five Fingers, we need to adapt slowly so changes to footwear should be appropriate to your current level of strength and joint mobility – anything with less heel and wider toe box than you currently wear is a start). Stretch your calves and hamstrings regularly. Change your sitting posture to encourage a neutral pelvis and ribcage. When standing relax your quads (thigh muscles) until your knee caps relax (I find this easier on my right than left for some reason). Sit on the floor rather than the sofa occasionally to change the angles of your joints. If you would like more information on how you can improve your foot health, I will shortly be putting together a 4 week workshop during which I will provide you with practical steps you can take to improve your balance, reduce foot pain and potentially indirectly improve other conditions. You will take note of how your feet are at the beginning of the 4 weeks and keep track of progress as you go along. If this is something you might be interested in please provide your contact details so that I can keep you informed on upcoming events. Disclaimer: the above advice is not intended to replace medical advice, if you have a severe condition causing pain please see your doctor.